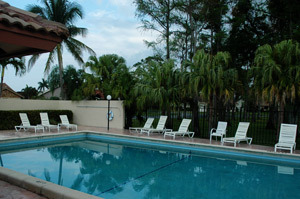 Pool area in the Timbers of Boca Raton in FL. Unlike many other planned communities in Boca Raton and Palm Beach County, the Timbers of Boca Raton is not a cookie cutter community with many different style homes within the community as well as varied colors and landscaping. All of the homes have plenty of space between each other with no zero lot lines and in lots of 1/5th of an acre and more. There is a community pool, heated spa and simple clubhouse on Chinaberry Drive along with a large sun deck, lounge chairs and bathrooms. The Timbers swimming pool and clubhouse are located next to a cypress preserve which serves as the community park. In the center of the community is a large fresh water lake with plenty of fish which attract local wading birds. Waterfront homes on the lake are on Chinaberry Drive, Red Oak Lane, White Oak Avenue, Hazelwood Lane, Water Oak Terrace. The homes in the Timber of Boca which border the north side of the development on Hazelwood Lane are located on a fresh water canal controlled by the Lake Worth Water district. Some of the homes along the Southern and Western borders of the Timbers of Boca along Black Maple Lane and White Oak Avenue back up to the Boca Lago golf course. The remaining homes on the western border of the Timbers of Boca community along White Oak Avenue back up to undeveloped land owned by the Jewish Community Center of Boca Raton. In order to maintain the high standards of the community the Timbers of Boca Home Owners Association makes sure that the basic community rules are followed. Publix Supermarket, Home Depot, Lowes Home improvement Center, Wal-Mart, Target, Best Buy, Office Depot, Office Max, Sports Authority, Toys R us, Walgreen's, 12 Strip Malls and the Town Center Mall. Dozens of fine dining establishments and most major fast food chains are within a few miles. Public golf course and driving range, Library, Community Park with ball fields and tennis courts, post office with 24 hour automated mail center and post office box access. West Boca Medical Center, Fire Station blocks away on Lyons Road, Palm Beach County Sheriffs office substations. Florida State Road 7 (US441), Palmetto Park Road, Glades Road, the Florida Turnpike, and I-95 and Bus Stops.